At the Ayni Institute, we have spent the past five years building relationships with our indigenous elders in Peru: documentary film-making duo Jose Huaman Turpo and Alejandrina Calancha; Amazonian healer Alberto Manqueriapa; and independent research and designer Zadir Milla. Our Ayni elders came together in April, 2018 during our first Yachay Seminar to share their stories, their work, and their visions for the world. Since then, we have continued working with them to develop films, books, and trainings to support what we consider to be a tradition of reciprocity. At the Yachay Seminar, we heard the voices of those who joined us who wished they had more access to the voices of indigenous communities. Through Our Voices we are taking our first step towards doing just that. We have struggled to find materials that represent our ancestral Latin American cultures in our local libraries and schools, and we know that these are not the only ancestral narratives that are missing. There is an absence more broadly of indigenous perspectives from mainstream narratives and institutions, and through our work with our elders we have experienced first-hand the difficulties of getting these voices into the public square. Through Our Voices, we want to bring forth stories from indigenous communities that have been historically marginalized, misrepresented, and subject to the lens of “the other.” We want to support indigenous authors, educators, and artists and imagine what it would be like to have these materials everywhere. To do that, we are going to start by building an online platform that will serve as a database to find indigenous stories from all over the world, all in the same place. 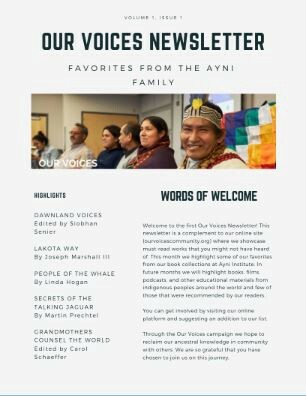 The depth and breadth of this information can be overwhelming, which is why we also have a monthly newsletter where we curate recommended materials around certain topics or themes. 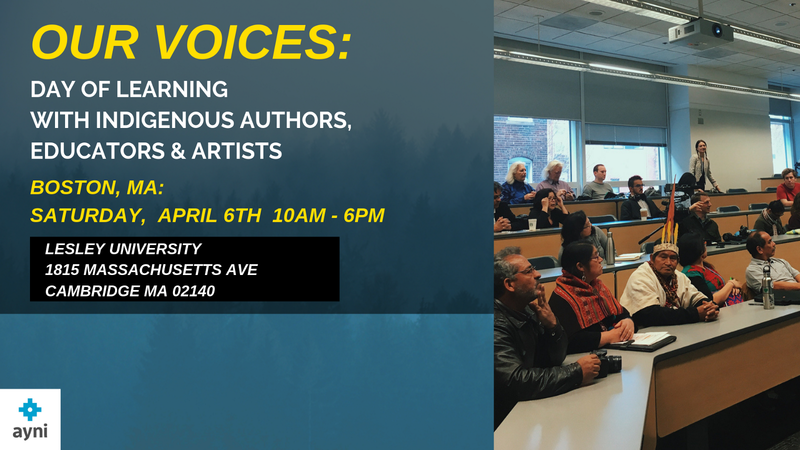 We invite you to take this journey with us, and specifically to join us during our first Indigenous Book Fair & Discussion with Indigenous Authors, Educators, and Artists on April 6th at Lesley University in Cambridge, MA from 10am-6pm. This event will allow participants to imagine what it would look like if they had access to indigenous educational materials in their schools and community organizations. RSVP here. In some ways this is our first day school. Our classes are those that were missing when we were growing up, and our presenters are our teachers. We will showcase indigenous educational materials from the Americas through panels of indigenous authors and educators discussing their work and communities, classes on different aspects of indigenous philosophy and culture, and a book fair where these materials will be available for purchase. We hope you can join us. Together, we will Raise Our Voices. We are honoring the ancestors by remembering the wisdom of life in order to build communities that can create an opening towards a reciprocal world.